Thanks to a 2008 post at Garvey Cey Russell Lopes for pairing these double-play shots. Field and sight lines match so closely, it's safe to say they're from the same White Sox-Royals game. Chris Stufflestreet (RIP) tried to sort out which game we're seeing in two 1973 Topps Photography posts: Double Play Starter? and Mystery Solved! The artificial turf and mix of uniform numbers led to general agreement on a spring training game at Terry Field, Kansas City's home from 1969-87. But when's the game from, 1973, 1972, or earlier? There's a business reason so much 1973 Topps photography looks dodgy. MLB owners locked the players union out of team facilities for most of February, closing off a large window for spring training photo shoots. 1973's bargaining agreement (signed Feb 25) established tenets still in place today--salary arbitration, "5 and 10," contract tender deadlines--but the month-long delay left teams less than two weeks to prep players for games. 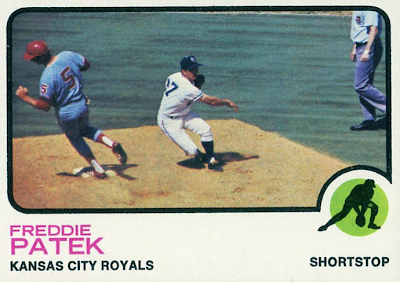 The slim pickings for new photos likely pushed Topps into lower-quality archive shots and lots of player airbrushing. Thanks to an eBay listing for Chicago's 1973 Spring Training schedule and Google news search, we can check these game situations for 1973, as KC hosted Chicago twice that spring in Ft. Myers. March 11: Royals win 4-3 in 10 innings (news story and box score), but Mike Andrews didn't play. March 20: KC prevails 4-3 in late-innings again, this time with Andrews in the lineup...but not at 2B (news story and box score). How about 1972 spring training, when White Sox #5 was Tony Muser and KC #33 was Bob Oliver? I couldn't find a spring schedule on eBay this time, but located two Ft. Myers match-ups in the news archive. March 12: Chicago beats KC 5-1 (news story and box score). Andrews plays 2B and homers, Patek plays SS, first basemen Muser and Oliver both reach base, and each team turns a double play. 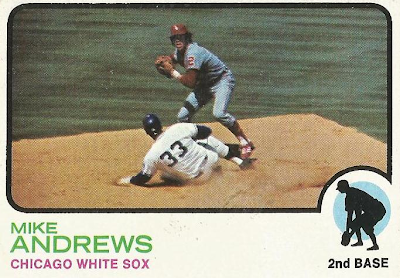 March 16: White Sox win 9-5 (news story, back one page from link), but Andrews doesn't play. Given available info, I conclude 1973 Topps #42 and #334 show double plays from Chicago's 5-1 win over KC on March 12, 1972, as Freddie Patek and Mike Andrews force runners Tony Muser and Bob Oliver at second. Batters were likely White Sox catcher Ed Herrmann and Royals 2B Cookie Rojas. UPDATE: Also read Bruce Markusen's dive into Mike Andrews' roller-coaster baseball story. Great stuff. oh man - spring training sleuthing. that is awesome. Thanks! Going through Google News felt old school, like working with rolls of library microfiche.